What child doesn’t love marshmallows? Even the ones who don’t like eating them, still love playing with them! Which is why we picked Marshmallow Science as our next unit study. 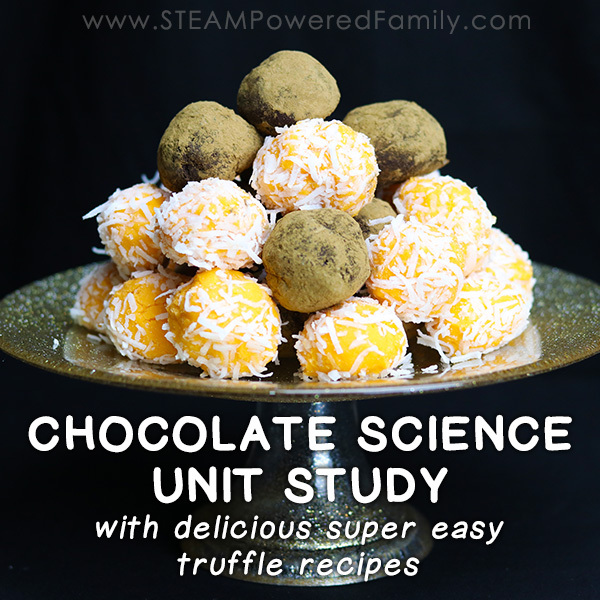 There is so much STEAM learning that can happen with these tasty, fluffy treats. 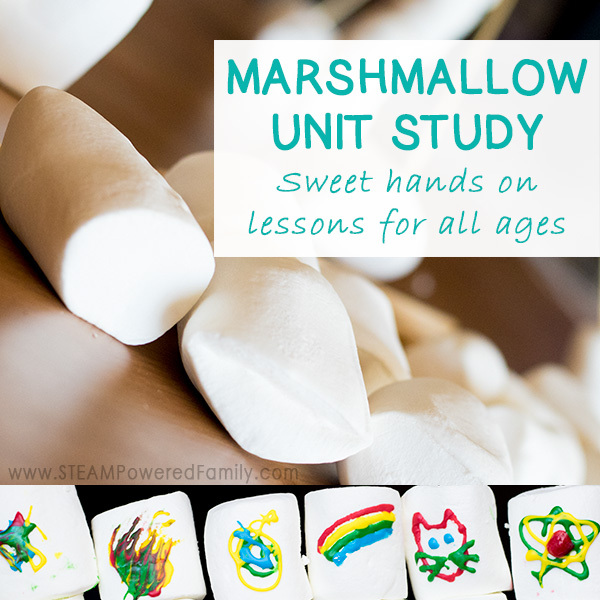 Check out everything we included in our Marshmallow Science Unit Study. One of our goals around here is to create lessons that can be adapted for a variety of ages, abilities and interests. With that in mind I’ve gathered up a number of different activities and resources so you can pick and choose what will work best for your Marshmallow loving students. Some of these activities can be used as young as preschool, while others are best suited to middle grade students. Use common sense, you know your students and children the best. What is the best way to start exploring marshmallows? Let kids play! Simply set out a variety of items like marshmallows of various shapes, sizes and colours, skewers, toothpicks, candy decorating pens, magnifying glasses or even a microscope, knives or scissors, and more. Let the kids get hands-on and learn. It doesn’t matter if they want to be scientists, engineers or artists, however they want to explore the marshmallows is fine. The more excited they are about learning, the more they will learn. Check out the beautiful results from our art inspired tinkering session using marshmallows as our canvas. Tip! For little guys a set of play dough knives and scissors works perfectly and are much safer for small fingers. Our favourite way to explore marshmallows is this hands-on learning activity making Marshmallow Play Dough. It is so quick and simple to make, and it is taste safe. 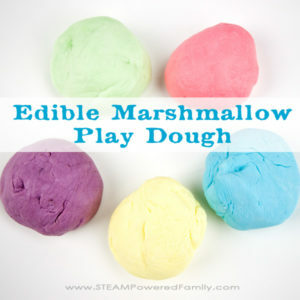 One boy said it tastes good, the other prefers his marshmallows not “playdoughed”, but all agree this activity is fun! Perfect for sensory exploration at all ages. Next on our to do list with exploring marshmallows? This non-Newtonian Fluid creation called Marshmallow Magic Mudd. This stuff looks amazing! For little ones who are still learning their five main senses, you can use marshmallows to help reinforce these lessons in a tasty way. Check out how much fun these guys had learning their senses with marshmallows. This next one is for the more adventurous folks who don’t mind a little mess. Have some ooey, gooey, sensory fun with these marshmallow created ghost hands. 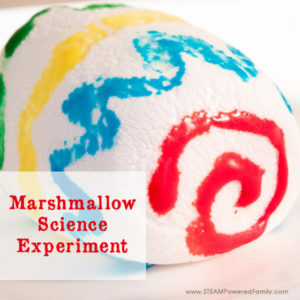 This STEAM Marshmallow activity is so simple and always creates lots of excitement. Simply have the kids decorate some marshmallows and then put them in the microwave to see what happens! We dove into all the science and details when we did this activity. To say it was a hit is a huge understatement! Why not use marshmallows to explore a little nutrition science? 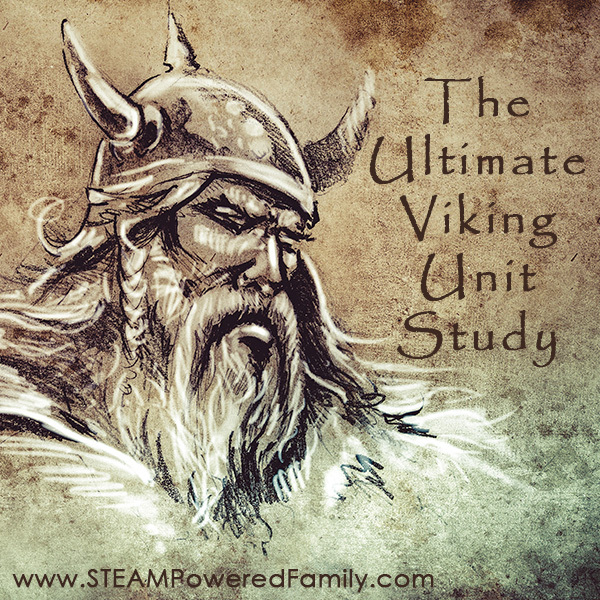 And with this activity there is a charming dragon to breath some fire and excitement into their studies. On a cold winter day, everyone loves a cuppa hot chocolate. With this melting marshmallow snowman activity, you can infuse a little science and learning into your tasty treat. Create a Marshmallow Engineering Challenge that will have kids smiling as they race to the finish with their sweet smelling constructions. 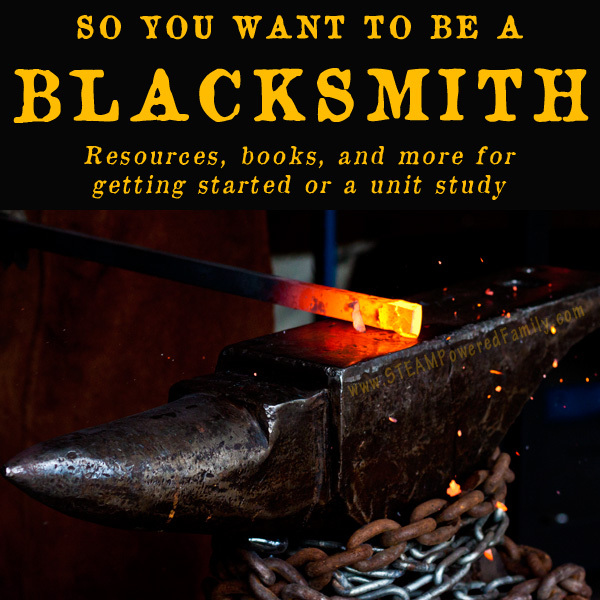 A great learning challenge for all ages that is easily adaptable. It’s like Jenga meets Marshmallows! Build a Marshmallow Catapult and launch into learning how to build and engineer with this fun activity. Rainbow Marshmallow Building is a beautiful way to create structures. From bridges to trees to a Cinderella! The possibilities are endless with this colourful activity. For a medieval variation on the above activities, challenge kids to build a castle and a catapult. Then act out a great ancient battle! For little ones just learning their letters, why not challenge them to build alphabet letter structures with marshmallows and toothpicks? 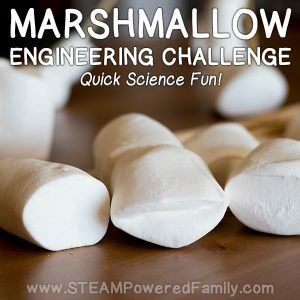 To add a fun twist to your engineering challenges, try using different shaped marshmallows. 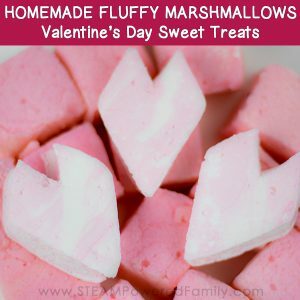 These adorable heart marshmallows are perfect for a Valentine’s Day STEM challenge. Once you have played and learned with marshmallows for a while, it is time to really dive into some amazing kitchen science and make homemade marshmallows. This activity is best with older kids and definitely requires a responsible adult. The results though? You will never be able to eat store bought marshmallows again. Need a sugar free Marshmallow recipe? Check out this recipe that uses artificial sweeteners. And for the vegetarians out there, I found this recipe. 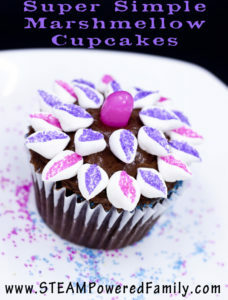 Marshmallow Cupcakes – This is such a simple idea but it looks gorgeous and kids love decorating their cupcakes this way. Fantastic for a party. Now we LOVE a good fudge around here, so when I came across some fudge recipes that use marshmallows as one of the ingredients, I was definitely curious. I found two recipes, this one and this one. I haven’t tried it yet to compare the fudge made from marshmallows to our traditional fudge recipe, but I think this might become one of our Candy Science studies. All in the name of science of course. These Marshmallow Penguins are the most adorable little guys. Perfect for a penguin themed party. This site also has a super cute marshmallow snowman. And don’t forget the always amazing s’mores! For fun twists on s’mores try these s’mores cookies and s’mores in a cone. 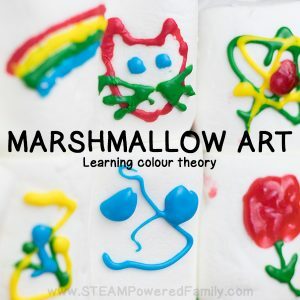 Have fun exploring and learning with marshmallows!